Being a medical assistant is a great job opportunity for students. Students will be able to work alongside doctors helping patients. In the state of Oregon, there are some different requirements and certifications that are needed to become a medical assistant. All of the rules and requirements will be laid out below to help you get your career started as a medical assistant. To be eligible to be a medical assistant, there are some requirements that need to be meet. •	Students must complete an OSBN approved medical assistant level 1 training program within the last two years or they have to have at least 75 hours in another program from a different state also within the last two years or completed training as a military corpsman or medic and have at least 400 hours of paid employment in the nursing field within the last two years. And lastly, students that have graduated from a medical assistant program between one and three years prior. •	Complete a national criminal background check and get fingerprinted. •	Take the medical assistant exam; this is administered in different locations around the state, and the test has two parts. A multiple choice question portion and a manual skills tests. There are also two ways that you can schedule the test, print out the application and send it to the OSBN office or schedule the test with your program instructor. •	After taking the test, you will be notified within ten days if you passed or not and if you didn’t pass, you would be given a list of things you need to improve on to take the test again. •	Your certificate expires every two years on your birthday, so you need to renew it, which cost between $60 and $75 depending on the certificate you are renewing. If you want to become a medical assistant, you have to apply and go to a medical board certified school. If you don’t choose the right school, your certification or degree will be worthless in the job market. You can also get a certification or an associate’s degree in medical assisting so decide which one you want before you start applying for schools. This is a list of all of the classes you will be taking to become a medical assistant. These are just some of the general classes that you will be taking in the Medical Assistant program but this class list might vary from school to school in Oregon, but they are required to gain employment in the medical assistant field. When you are looking for classes at schools for your medical assistant degree, you should always keep your options open and never enroll in the first one you come across. There are many different programs in Oregon and doing your research on each one of them will help you pick the right one the first time. You don’t want to enroll in a school that isn’t accredited and find out later that your degree is worthless. In the United States, there are some accreditations that a school must have to offer a medical assistant course. They can either be accredited by the Commission on Accreditation of Allied Health Education Programs also known as CAAHEP or Accrediting Bureau of Health Education Schools also known as ABHES; these are required if students want to become certified or registered. And accreditation is required from the American Association of Medical Assistants, the National Health Career Association, and the American Medical Technologists. There are currently over 600 CAAHEP programs and over 200 AVHES programs in institutions across the United States. According to the CAAHEP and ABHES programs must meet educational standards, lecture, lab time, and sufficient classrooms to be accredited. In some practices, there are a few different kinds of jobs that you can get with your medical assistant degree/certification. •	Administrative Medical Assistant: This job requires you to fill out insurance forms code patient’s records, answer phones and set appointments. •	Clinical Medical Assistant: This job has different duties including doing basic lab tests, disposing of contaminated supplies, and sterilizing medical equipment. Additional responsibilities include telling patients about medications or a special diet, preparing x-rays, drawing blood, changing dressings, and removing stitches. •	Ophthalmic Medical Assistant: Working with optometrists and ophthalmologist to help patients with their eye care. You will show patients how to insert and remove contact lenses including how to care for them. •	Podiatric Medical Assistant: Working with a podiatrist, you will be making castings of feet as well as exposing and developing x-rays and help in surgery. Medical assistants work in different places and hold around 600,000 jobs in 2014. About 59 percent work in doctor’s offices, 15 percent work in the state, local, or private hospitals, 10 percent work in other offices, and 7 percent work in outpatient care centers. Medical assistants work full time and some even work on weekends, holidays, and evenings. •	Analytical Skills: Medical assistants have to understand medical charts and diagnoses and be able to follow the correct protocols. They also have to know how to code medical records for the purpose of billing. •	Detail Oriented: The vital signs of a patient need to be precise and recorded on their medical record. Physicians and insurances companies need accurate results. •	Interpersonal Skills: Medical assistants must be able to relay patient information to medical personnel and physicians. They will interact with patients, and they have to talk with them calmly and professionally. •	Technical Skills: Medical assistants must be able to use basic clinical instruments to check patient’s vital signs. The median salary for a medical assistant is around $30,500 a year as of 2015. About half of all medical assistants earn more or less than this amount. The lowest is around $22,000 a year, and the highest is around $44,000 a year. According to data collected in May of 2015, outpatient care center medical assistants make around $32,000 a year. Medical assistants that work in private, state or local hospitals make around $31,000 a year. Medical assistants that work in physicians’ offices make around $30,000 a year, and other health practitioner’s office medical assistants makes around $28,000 a year. Why Being a Medical Assistant is a Great Career Move? 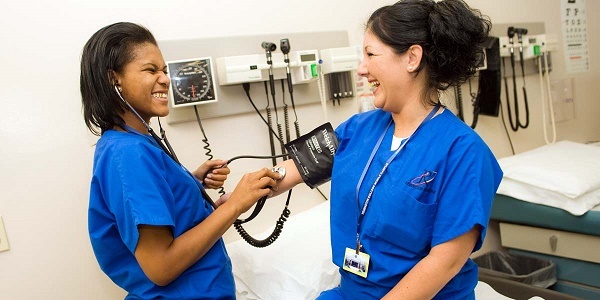 Becoming a medical assistant is a great way to have a fulfilling career. There are some great reasons that people are not choosing to become a medical assistant. One of the main reasons is that people can get certified as a medical assistant in as little as two years. And some programs can be completed between 15 and 19 months. You will find yourself in a licensed trade that can be used just about anywhere in the United States. After you are licensed after you take the Certified Medical Assistant Exam, you have the option to work anywhere the jobs are located. The growth for this kind of work keeps growing; it is expected to increase 29 percent by 2022. This is because baby boomers are now at the age where they need medical attention and more medical assistants are needed. There has also been an increase in patients because of the implementation of the Affordable Care Act. Now millions of Americans now have health insurance and it has increased new patients to practices. In fact, it was reported that when the Affordable Care Act went into effect, there was a shortage of medical professionals. There will also always be a need for medical assistants, which means there is job security with this career. There are so many different places that medical assistants can work, hospitals, clinics, ambulatory care, private practices, and more. This makes finding a job easier and gives you the flexibility to choose where you work. And becoming a medical assistant can open up doors to different careers in the medical field. And working with patients and doctors will give you a sense of fulfillment. What Do Employers look for in a Medical Assistant? •	Customer Service: Medical assistants have to have an understanding that patients are customers, and they want to make sure they have a great experience at the office from the time they come in till the time they leave. This needs to be done in a professional manner as well as make sure the patients are satisfied with their experience. •	Honesty and Integrity: Medical assistants have to have honesty and integrity to be trusted. This means never compromising their values and always doing the right thing for patients and doctors, and when an error is committed, medical assistants need, to be honest, to help keep patients safe. •	Adaptable: Medical assistants need to advance and improve in their field. This requires learning new things on the job and keeping up with the new procedures. And you will be expected to fill in for co-workers that can’t work. You also have to learn how to adapt to emergency situations that may come up on the job. •	Be a Team Player: Medical assistants need to know how to work with other personnel in the office and get along with everyone there. •	Humility: Medical assistants must be able to speak up when they don’t know how to do something. And they also have to know when to praise their peers and not brag. They must use criticisms and learn from them. •	Communication: Medical assistants must know how to communicate well with other people on staff including the doctors. Communication is key to ensuring that doctors are aware of patient’s conditions, it could be life or death. •	Self-Motivation: Medical assistants must be self-motivated, they need to know what needs to be done at the office without having to ask other personnel. •	Smile and Attitude: Medical assistants have to stay positive during work, this means never letting patients know that you are having a bad day. You have to be pleasant even if it is hard and have a good attitude while remaining professional. All of these qualities are what employers look for in a medical assistant, while some of these can be learned others, people just have them. If you are unsure about what employers look for or want to know more then as other medical assistants what is required of them and what you should know before you go to your first interview with a potential employer.